Oh thank you for this review. I like that color. It looks like it might be a good match for my new pen. I have had some disappointments with Herbin Ink because the colour I got was not as saturated as I was led to believe. Vert Olive looks like Army Green with yellow added. The Tomoe River paper makes the colour look better than my experience of it was. Because it was before I got any Tomoe River paper. Herbin is not a saturated ink....or not the 5 or 6 I have, they are however good two toned shading inks....which was why I chased them. This though is not my color. 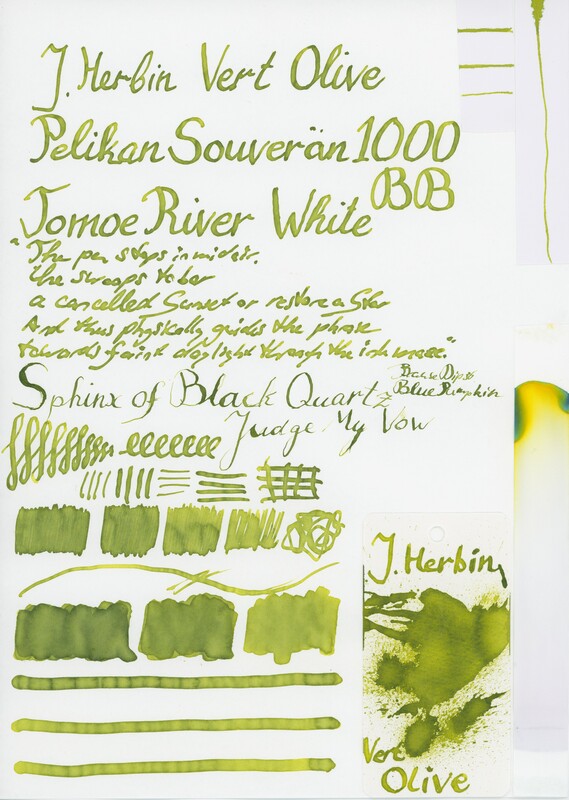 """The Tomoe River paper makes the colour look better than my experience of it was. Because it was before I got any Tomoe River paper."""" I've had for me, good luck with decent papers 90g and better and Herbin. Edited by Bo Bo Olson, 13 August 2018 - 20:36.